Either tap the New Message icon and enter the number of the intended recipient or pick up on an existing conversion. To add an attachment, tap the icon that looks like a paper clip to the left of where you enter text. The paper-clip icon brings up the screen you see here, which asks what kind of file you want to attach. Your choices include pictures, videos, audio files, and some others when you have some good files to share. For now, it’s just good that you know you have options. File types you can attach to a text. Get ready to be amazed. At the bottom of the screen, you have three choices. The figure shows the Other category. This is for any file you want to attach that is already on your phone. It can be your electronic business card. It could be a video. The middle option, Gallery, takes you to all the images you have stored on your phone. 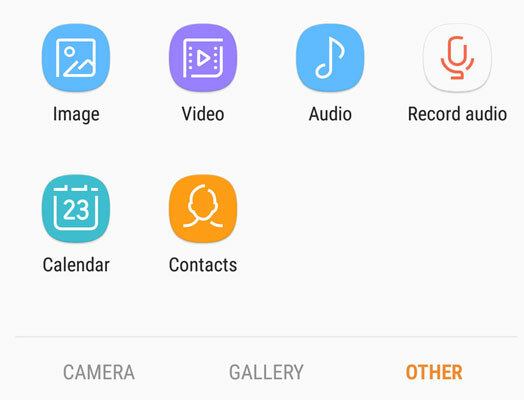 Samsung knows that the most common attachment is a photo. Tapping the Gallery options makes it that much easier. The last option, going right to left, is the Camera. When you select this option, it opens up your camera so that you can take a picture and immediately send it to the recipient. How cool is that?! When you’re done with the text portion of the message, tap the Send button, and off it all goes.